It was time to load the website copy I’d written for a client. I was on my first conference call with a website developer who was training me to navigate the back end of the new website. And I was nervous. Posts versus pages … categories and tags and keywords … featured images, menus, widgets …. I’d written plenty of website content for clients but loading it in the back end was new to me. I had plenty of reasons to fear technology. I didn’t use a computer until I was 30 years old. Even today, I need a step-by-step list of instructions to use the TV remote. But I was motivated to get past my techno fears when it came to managing websites because I like saving money and I like DIY. Plus, I’d promised my client that I’d load her site and I wanted the paycheck. So I ate a big piece of humble pie and ‘fessed up to the developer, explaining my utter confusion. “I’ll take you through it step-by-step,” he promised. And when I hit a snag the next day (and the next week and the next month), he answered my panicked phone calls and apologetic emails. To me, that web developer represented grace. He accepted my weakness. He was able to give me what I needed when I needed it the most. And it stuck. Today, years later, I load website copy nearly every day in all different platforms. 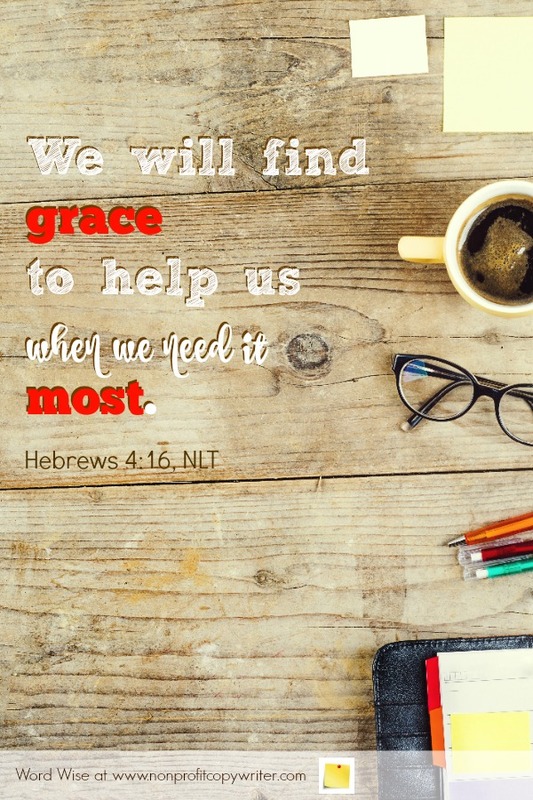 Boldness in vulnerability: isn't grace ironic? I was in need, but I needed to be bold and ask for help. The result was a big, long-term win. I’m so glad I ‘fessed up. What about you? Be bold and admit your need. Thank you for your promise of grace. Let me do my part. Let me face my weaknesses boldly. Empower me to ask for help. Show me where to get it. The Long-Tail Keyword: Mark Used Specifics in His Gospel. Shouldn't You? The Opt-In: Why Do Readers Choose You?